The Prodigy have spoken about how Dave Grohl ended up thwacking tubs on their new album Invaders Must Die. "We've known Dave for quite a few years," Liam Howlett told the BBC. "We haven't just phoned him up and said, 'Dave can you get on the record?' He just emailed to say he's finished his touring, he really loves drumming and wants to get back into [it]. Keith Flint was also keen to stress that that this was a genuine collaboration, albeit the only one on the album. "We didn't do it to be us and Dave our rock buddy collaboration, but just as a friend of ours who does wicked drums that did a track with us. If it hadn't come together so natural we'd never have done it," he said. Howlett went on to explain how the hook-up had worked: "He sent me some drums on a hard-drive with hope that it might inspire me to write a song - sure enough when I got the hard-drive it was really inspirational. It's good to hear him play the drums without any other instruments - people don't hear that. "Within the first ten seconds of it being on I was like 'Yeah this is a song' - the track was born 'Run With The Wolves'." 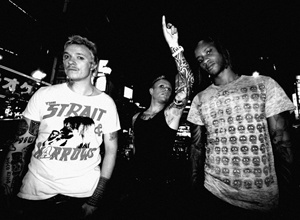 Read the full Prodigy interview at the BBC website.